A PLYMOUTH infants school has been treated to a refurbished toilet block. The indoor toilet block at Hyde Park Infant School has received a much needed update, which has turned the block from drab to fab with new high tech facilities in place. 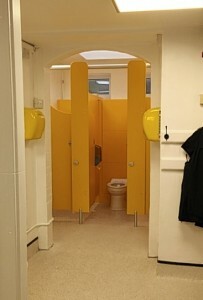 The toilet block, which now has infa-red sensitive toilet flushes and electric hand dryers, has seen updates over the years but nothing to this standard, with pupils saying the new block is “really lovely now ”. The staff and pupils were delighted with the finished project which was funded by generous ex-pupil Greg Lang of GMC projects who matched the schools available funds to refurb the block. Business manager Mrs Deb Hinchcliffe said an upgrade has been wanted for some time and with Greg’s “generous support” it has become a reality.